Do you ever pick up a book, and just feel like you've reunited with an old friend? That's what it was like when I began Where Hope Prevails. 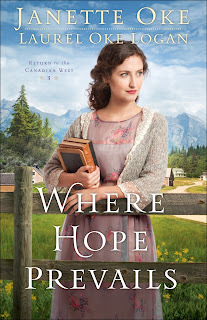 I was given the opportunity to review this book by Bethany House, but what I didn't realize was, this was the 3rd book in a series. hahahaha Oops. That's what I get for my enthusiasm to read this book! It was ok because you can never go wrong with a Janette Oke novel. Her daughter Laurel Oke Logan joins her in co-authoring. I absolutely loved this story! Even though I know the main character Beth is introduced in the earlier novels, which I haven't read, I felt like I already knew her. I've had the same reaction as Beth when visiting a town I haven't been to recently, and all of the trees are gone and development has come in! As Beth comes back to town, so much has changed, and her reaction would be similar to mine. Beth faces the challenges that show up with the changes in town probably the same way I would. She hopes to marry Jarrick, but that means she needs to know how to cook. Oh dear, that can be difficult. When she meets a man who doesn't share her faith, I have to admit, I would've had the same reaction she does. Of course, because her reaction is a large part of the story, it makes me take a step back and wonder about how I respond to certain situations. Let's just say, it's a good thing she has people in her life, just like I do, to have a better attitude. Having just been married myself, I understand the anticipation of waiting for the proposal and thoughts of planning a wedding! There's excitement and stress galore. Who doesn't love a wedding? I'm looking forward to going back and reading the first two books. if they're anything like this one, they're books that can be read without reading the others, but flow well together as you get to know the characters along with the trials and joys they share.